PFF5-101G offers additional +2 of caster and is a high performance option to PFF5-101. Aimed at offering greater precision with improved geometry for people wanting the very best from their Mini. This new part, fitted to the rear of the front wishbone has a hard anodised aluminium outer shell with one of our unique low friction polyurethane centre bushs. The poly/alu combination creates a low friction rotating bush reducing the forces acting on the arm. Lower arm deflection has been decreased by reducing the compliant material within the aluminium shell. Additional caster angle will give more negative camber when cornering giving improved tyre to road contact. Results are improved geometry when turning giving additional grip, steering control and feel with less movement in the arm under cornering and braking. 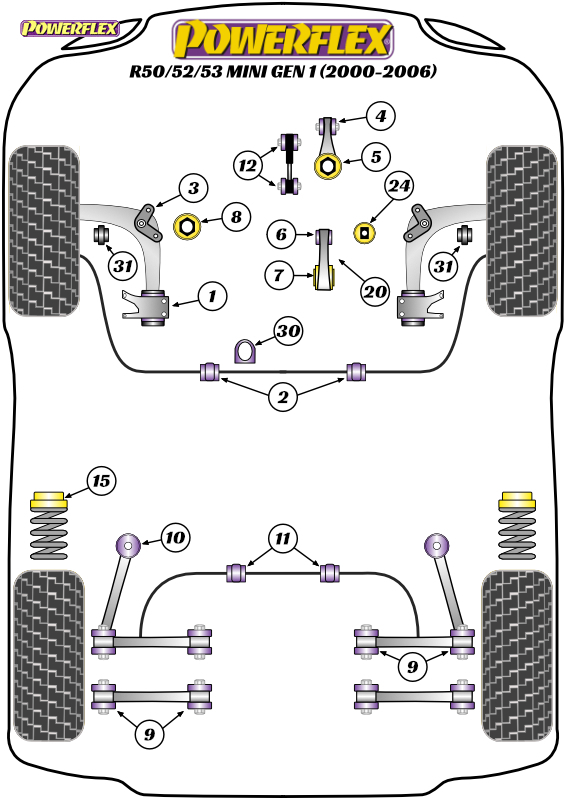 When fitting PFF5-132G Camber Ball Joint, which offers additional negative camber, we recommend using PFF5-101G which neutralises the caster lost by moving the arm position bringing the caster angle back to standard.